This is a simple electronics project that you can build yourself with some simple tools. 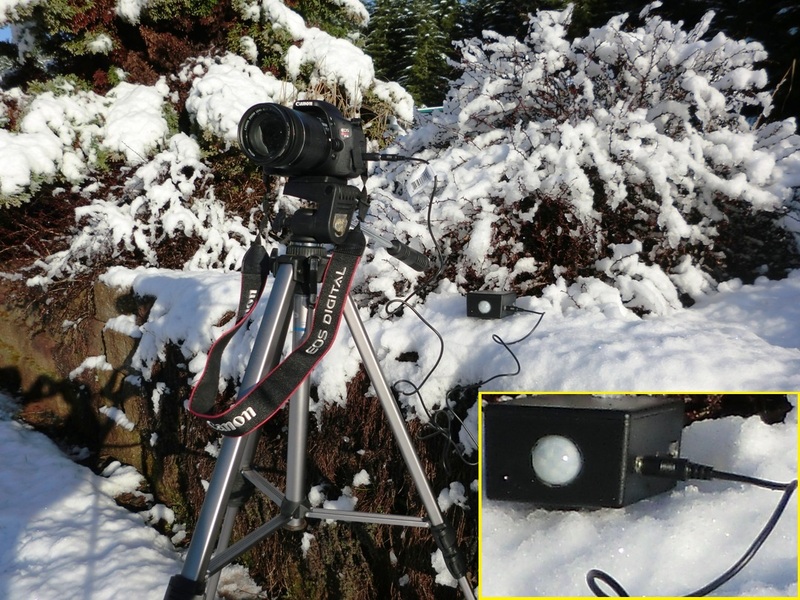 The device triggers your Single Lens Reflex Camera when it detects motion within a field. This particular sensor specification says it can be adjusted for 15ft or 30ft range, however I've tested it at 40ft and it works fine. It senses movement both in the daylight and dark. With the ability to sense movement at dark it is ideal for nature photography but also works if you want to capture something sneaking around. This project uses parts that you can buy from the JameCo on the internect or from your local electronic parts store. The circuit is fairly simple and the details are listed below. I've put in a red led that indicates the power is on. It is good to know there is power going to the box. There is also a green led that turns on when the camera is triggered. This gives another indication but it is really not necessary. The IR detector has a red led inside the lense that turn on, as well. Since the camera has a 2.5mm micro phono plug, and they are hard to get, the connection is a 3.5mm phono plug. I just used a 3.5mm female to 2.5mm male adapter obtained at Radio Shack. RS also has a 2.5mm plug that I could have adapted to the male 2.5mm cable I bought at Jameco but I found this small plug very unreliable, so I would recommend against it. 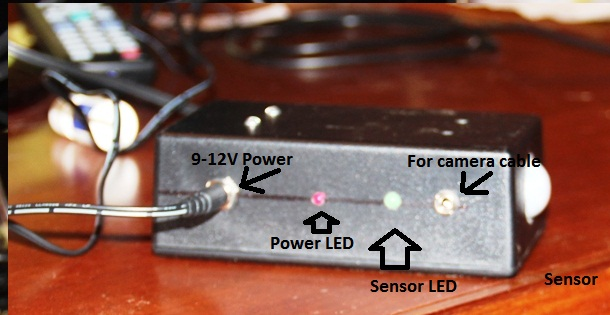 The power supply uses an adapter that can run from 6V to 12V. It has a standard power connector and the adapter is pretty cheap so I boughta 12V just in case. Turns out this was an overkill. The adapter I would change, but the rest of parts worked out well. As you can see from the schematic the construction is simple, just a few components. Here are the details you need to know. I've indicated it above, but it bares repeating that the Canon cameras have a 2.5mm micro phono plug in the body. I've used a 3.5mm because the cable is more durable, it's cheaper, and it's easier to build with. With a 6' 3.5mm male to 3.5mm cable, it plugs directly into the box on one end, and to the correct adapter on the other. Don't know what I've missed, but if you have any question just write me. My email address is on the contact page of the website.